I don't know about you, but I think cookie dough in any form is pretty much the best thing ever. Sometimes I find myself wanting to make cookies just so we can enjoy half the dough before it makes it to the oven. This cookie dough recipe is entirely "safe-to-eat", meaning there aren't any raw eggs in them at all (like the raw eggs stop us from eating it anyway...). This peanut butter cookie dough tastes fantastic with or without chocolate chips, but I absolutely loved it covered in chocolate! There's just the right amount of chocolate to peanut butter ratio, and the texture is smooth and perfectly doughy. If you're not a peanut butter fan, I highly recommend trying out my no bake chocolate chip cookie dough. Add in peanut butter, milk, and vanilla and mix until well combined. Slowly add in flour, then mix in chocolate chips. With your fingers, press dough into the Silicone Square Mold (found at Wholeport). Place mold in freezer for at least 30 minutes. Melt 1 cup semi-sweet chocolate chips in microwave or double broiler. 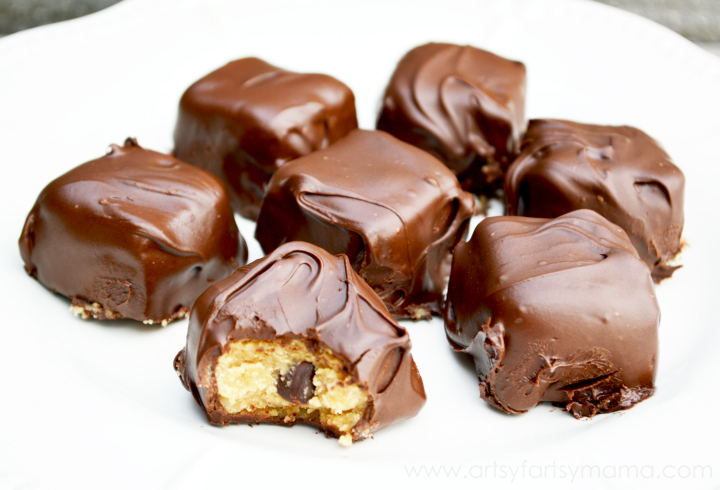 Remove dough squares from mold, and dip them into the chocolate with a fork and spoon the chocolate over top until the truffles are covered. Once covered, carefully place the truffles on a cookie sheet covered with a piece of wax paper. Making this cookie dough is super easy for the kids to help with, too! 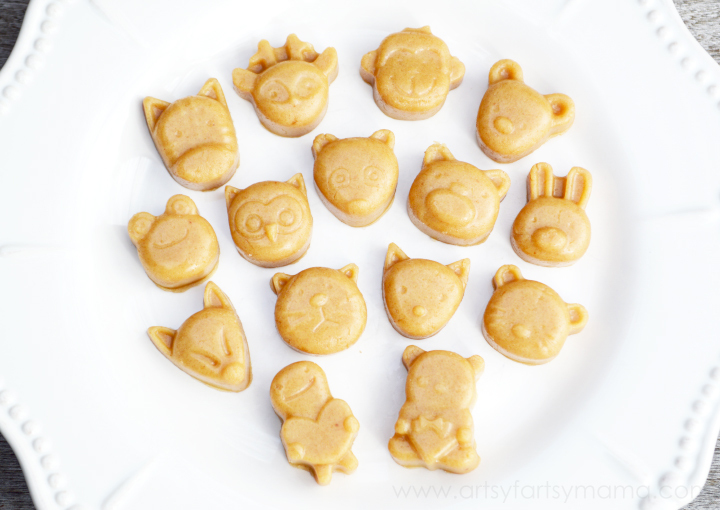 To turn this cookie dough into a fun treat for kids, simply mix up the peanut butter cookie dough without the chocolate chips and press the dough into a Silicone Animal Mold (found at Wholeport). Keep the dough in the fridge or freezer to enjoy these adorable, bite-sized treats any time! If eating raw cookie dough is wrong, I don't want to be right. I received products from Wholeport in exchange for this post. All opinions are entirely my own. Oh, YUM! I could go for one of those right NOW! Heaven!! Can't wait to try these! Sounds delicious! I love cookie dough, but can't eat it since I'm pregnant, so this will be a great alternative! Just pinned it! That little animal mold is so cute! YUMMO! When should I be by to sample these with you? I'll bring by two tall glasses of ice cold milk! Wow, those look sooo soo good. My mouth is actually watering! Oh my goodness, I need to make these ASAP!